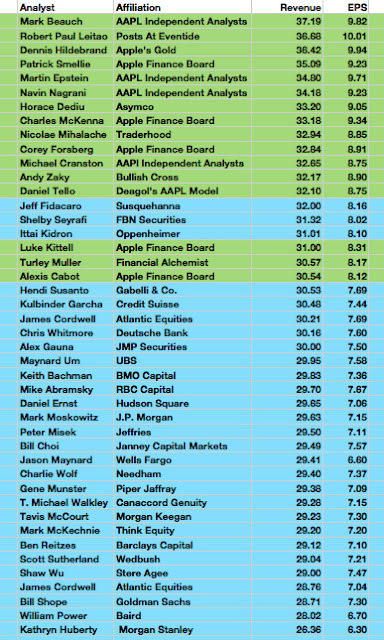 Each fiscal quarter Apple 2.0's Philip Elmer-DeWitt provides an index of quarterly estimates that include numbers from a select group of bloggers and numbers from Wall Street pros. For the September quarter, the differences in the estimates from the bloggers and the pros have the widest divergence since the quarterly indexes began. This quarter the gap is so pronounced it might best be described as a chasm. Revenue estimates range from a high of $37.19 billion from Mark Beauch of the AAPL Independent Analysts group to a low of $26.36 billion from Morgan Stanley's Kathryn Hubert. On earnings per share, the estimates range from a high of $10.01 put forward by this author to a low of $6.30 also from Kathryn Huberty. The table below lists the average revenue and eps estimates from the 16 bloggers and the 28 pros who submitted revenue and eps numbers. There's more to the difference in the average eps estimates from the two groups than the difference in revenue estimates. This difference is what I call "The Apple Analyst Sandbag Factor." 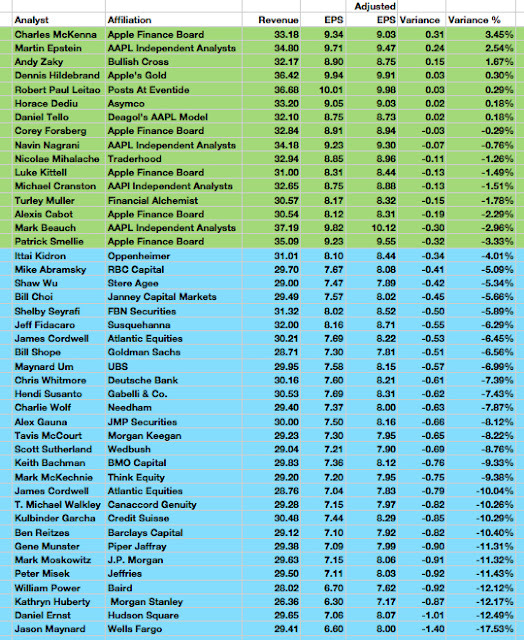 The purpose of this exercise is to remove differences in the revenue estimates from the numbers submitted by the individual analysts and compare each analyst's eps outcome to their respective revenue estimate, using Apple's June quarter results as a constant in the review. The outcome of the analysis indicates the Wall Street analysts are forecasting a significant deterioration in Apple's net income and eps performance per revenue dollar based on their own revenue and eps numbers. This anticipated deterioration in net income and eps performance represents the "Sandbag Factor." The chart below lists the September quarter estimates from the analysts. The content is courtesy of Apple 2.0 and is from the article titled, Wall Street Still Doesn't Understand Apple published on October 11, 2011. The analysts are ranked by revenue estimate. 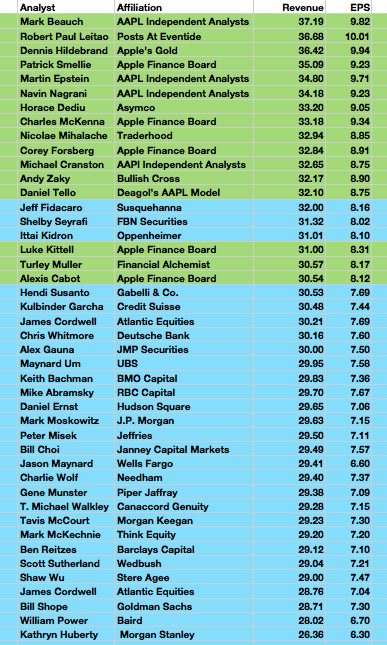 The bloggers are highlighted in green and the Wall Street pros are highlighted in blue. To determine the Sandbag Factor I used 941 million fully diluted shares and Apple's 25.58% of revenue that flowed to the net income line in the June quarter as constants. I multiplied each analyst's September quarter eps estimate by 941 million shares to determine a net income number. I then divided that net income number into the analyst's revenue estimate to determine the percentage of revenue each analyst estimates will flow to Apple's net income and eps lines. Following this exercise I determined the variance between this percentage and the 25.58% of revenue that flowed to the net income and eps lines in the June quarter. To make the review complete, I computed comparative eps outcomes based on each analyst's September quarter revenue estimate and the June quarter's 25.58% of revenue that flowed to the net income and eps lines. This determined the "Adjusted eps" in the table below. The difference between the computed or adjusted eps outcome and each analyst's September eps estimate is listed as the "Variance." The Variance %" or the percent difference between the adjusted eps and the analyst's September quarter eps estimate is the "Sandbag Factor" or the percentage by which an analyst's eps estimate based on their own revenue estimate varies from the June quarter constant. A positive variance indicates an analyst's expectation of an improvement in Apple's net income performance or the percentage of revenue that flows to the net income line. A negative variance indicates an analyst's expectation of a deterioration in Apple's net income outcome relative to revenue. 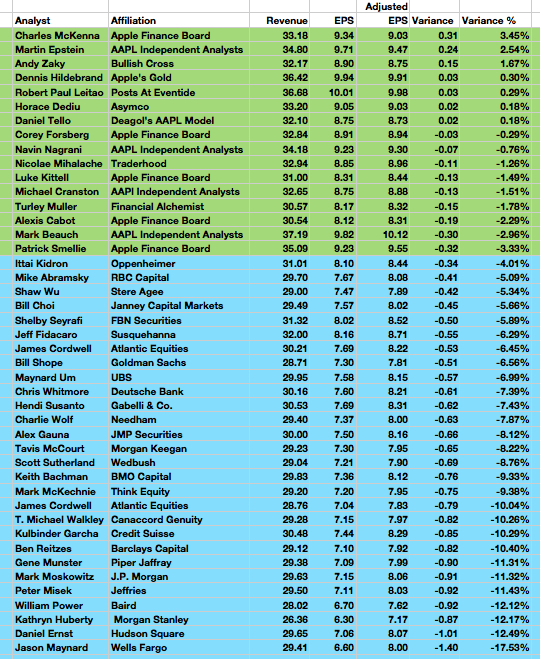 The table below, ranking each analyst by the Sandbag Factor variance percent, illustrates an expected deterioration in Apple's revenue to eps performance by the Wall Street analysts of no less than 4.01% by Oppenheimer's Ittai Kidron to a 17.53% variance for Wells Fargo's Jason Maynard. Among the bloggers, Charles McKenna expects an improvement in Apple's net income performance to 26.49% of revenue and Patrick Smellie estimates a decline to 24.75%. Independent analysts Daniel Tello and Horace Dediu have the smallest variance in their September quarter eps estimates compared to the June quarter percent of revenue that flowed to the eps line. The chasm between the eps estimates from the bloggers and the Wall Street pros in the September quarter analyst index published by Apple 2.0 is widened by "The Apple Analyst Sandbag Factor" or the deterioration in Apple's net income performance relative to revenue expected by the Wall Street pros. Differences in gross margin expectations and estimated tax rates will impact the company's net income performance relative to revenue. However, there were no major product introductions in the quarter to pressure gross margins. Based on their own revenue and eps estimates, the Wall Street pros are forecasting a deterioration in Apple's net income and eps performance relative to revenue. To the extent their eps estimates relative to revenue vary from the June quarter results, one might conclude they are cautiously underestimating or "sandbagging" their expected eps results. We'll know on Tuesday how close each of the analysts get to the mark after Apple releases the company's results.